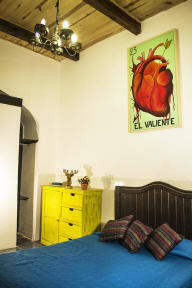 Gente de Más Hostel is a beautiful structure built in an old house of the 1856. It has been renewed preserving its historic style but providing modern and appropriate services in order to give a pleasant stay to our guests. It is a cosy and small place, thing that allow us to offer a better and personalized service. It is located in Puebla City downtown, just four blocks from the Cathedral of Puebla. 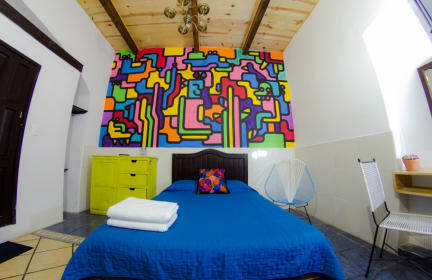 The Hostel is exactly in the Historic center of Puebla City, near the most important area full of typical restaurants such as the 'Restaurante La Fonda de Santa Clara”, or the “Flavors Market”. The Cathedral is around 5 minutes walking from us. The bus stop is at only 10 minutes from here and you can catch buses to Cholula. The hostel offers private and non-private rooms. We have big dorms with six beds, with individual light and lockers for your belongings. All our rooms are equipped with Cable TV, WiFi internet and hot water all day. In addition we have common areas, kitchen, reading and playing rooms.